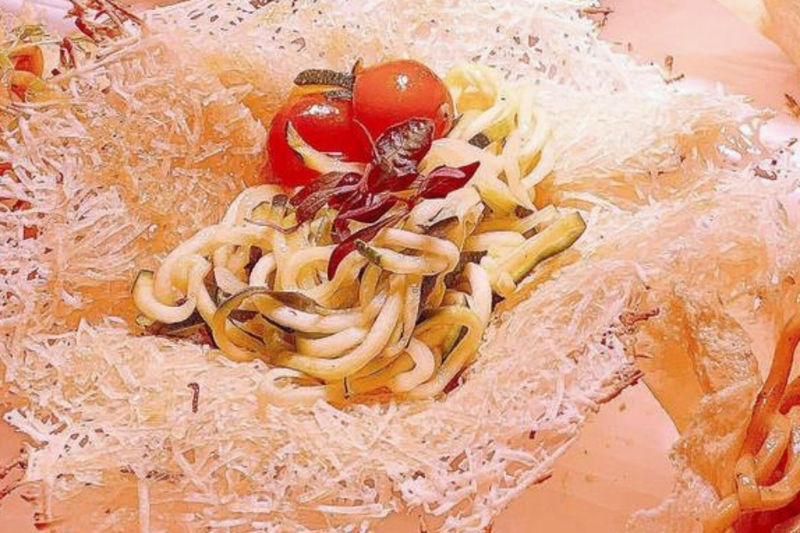 An Italian restaurant in Cardiff serves spaghetti in bowls made out of vegan cheese. Piatto, a new eatery in Cardiff Bay, has a range of well-marked plant-based dishes on its menu, including a vegan penne pesto di rucola e noci (rocket salad, walnuts and virgin olive oil), a kale salad, lasagne, and a pudding pizza served with icing and seasonal berries. There are two types of pasta - penne and spaghetti - as well as courgette pasta, as well as three vegan-friendly sauces - including a slow-cooked cherry tomatoes and fresh aubergine 'Norma', and 'Pomodorini' - cherry tomatoes tossed with basil, virgin olive oil, and crushed garlic. All can be served in the hand-sized vegan-friendly cheese baskets for £3.50 extra. The restaurant is a venture between Coronation Street star Luca Malacrino, and his dad, Giovanni - a restauranteur with more than three decades of experience. "My favorite food is pasta - if I could eat anything for the rest of my life it would be a big bowl of my dad's pasta," Luca Malacrino, who has starred in US shows including Grey's Anatomy and appeared in a film directed by Francis Ford Coppola, said in a statement sent to Plant Based News. "A lot of Italian food is vegan, but it's not always marked as such on the menu, so people can miss out. Living in LA, the majority of places to eat are vegan-friendly and options in the UK are getting better all the time. "I have a lot of vegan friends back home and pasta is a staple in their diet. I'm so proud to be able to offer delicious vegan-friendly pasta dishes that are a bit more special, in a really special venue that's perfect for date nights, in my hometown of Cardiff."